To meet divergent demands of the clients in an efficient manner; we bring forth an exclusive range of Black and White Surface Protection Film. Color: Transparent, milky white, black & white, blue, red etc. We are offering Paint Protection Film Roll to our clients. transparent and colured. It is used to protect surfaces of various textures and compositions. Stainless steel sheets, aluminum sheets, color coated sheets, composite panels, PVC and PC surfaces, and decorative laminates, to name a few. 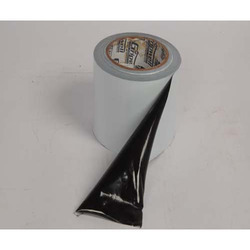 The surface protection film tape, offered by us, is coated with high pressure sensitive adhesive and is available in various sizes, transparent, white and black colors at industry leading prices. It used for paints due to transportation of products. These are also known for preventing the dirt during the process of fabrication, transportation and installation. The Transparent Protective Film provided by us is highly resistant to water and moisture. It offers excellent protection. Sun Control Films that we manufacture and supply are widely used to provide complete protection to windows and other surfaces from harsh UV radiations. These easy to install films are available in different attractive shades and cater to the varied needs of our clients. Sun Control Films offered by us are highly appreciated for providing a clear view. We are engaged in manufacture and trading of superior Frosted Glass Films Type 2 that are extensively used as furniture decorative item. These are manufactured in compliance with prescribed standards of the industry using premium quality raw material. Furthermore, these can also be used as protective shields for books. In order incorporate privacy factor on the interiors of the glass rooms, our clients can rely on our range of Privacy Films. The Glass Frosted Design Films are designed using quality proven material at our vendor’s ends. With the objective to suit diversified needs of the clients, we offer our range in various designs. Protect your valuables from transit scratches and damage with these low tack films keywords: PF tapes, low tack tape, SPF, surface protection tape, black and white tape, aluminum composite panels, modular office, automobile protective film, UV protection films. We have taken dealership for Protection Film these rolls are in difference microns from 40 to 80 microns and in different sizes i.e.20 and 24. The uses of these Rolls are done for protecting the glass at the time of transferring the glass from one place to another. No Designing work is done on the Rolls.